2018. Jackson C. Rose & Julia H. Haggerty. 2017 Energy Impacts Symposium. Kristin K. Smith, Julia H. Haggerty. 2017 Energy Impacts Symposium. Julia H. Haggerty, Kristin K. Smith. 2017. Energy Impacts Symposium. Kathryn Bills Walsh and Julia H. Haggerty. 2017. American Society of Mining & Reclamation Annual Meeting. Kathryn Bills Walsh and Julia H. Haggerty. 2018 Energy Policy Research Conference. 2019 American Association of Geographers Annual Meeting. Exploring Rural Resilience Pathways for Transitioning Coal Communities in the U.S. West. 2019 American Association of Geographers Annual Meeting. Kelli Roemer. Soil & Water Connection in the Judith River Watershed Documenting the Human Management Legacy, an SES Approach. 2019 Presentation to the Consortium for Research on Environmental Water Systems (CREWS). Julia Haggerty and Andrew Haralam. Planning for the Closure of Coal-fire Power Plants. 2018 Energy Policy Research Conference. Jackson Rose. Strengthening Community Resilience at the Energy-Agriculture Nexus: Identifying Resilience Traps in Bakken Communities. 2017 Energy Impacts Symposium. Kristin K. Smith, Julia H. Haggerty. 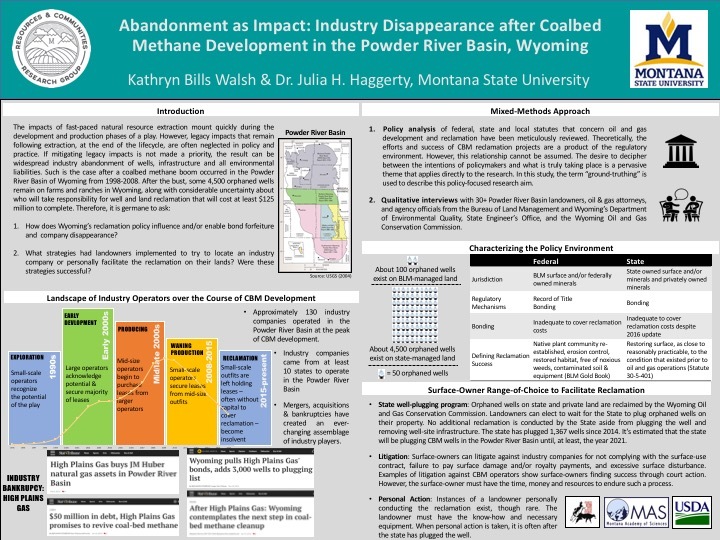 Abandonment as Impact: Disappearance After Coalbed Methane Development in Powder River Basin, WY. 2017 Energy Impacts Symposium. Kathryn Bills Walsh and Julia H. Haggerty. 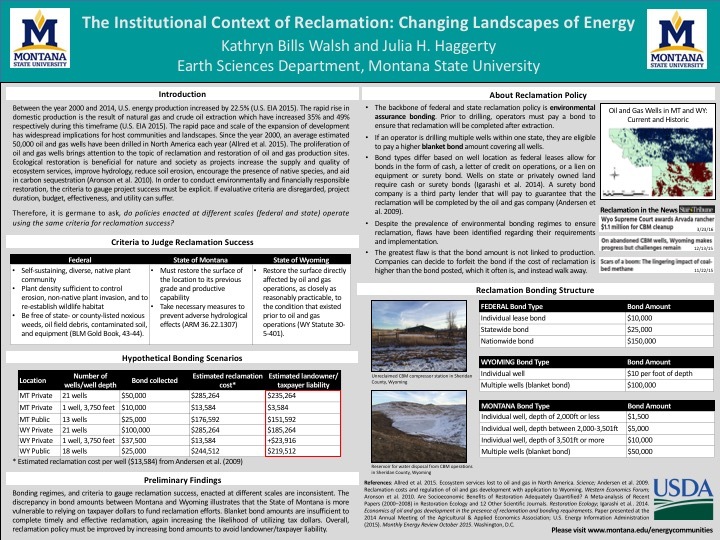 The Institutional Context of Reclamation: Changing Landscapes of Energy. 2017 American Society of Mining & Reclamation Annual Meeting. Kathryn Bills Walsh and Julia H. Haggerty. Research Fatigue in Energy Boomtowns. 2017 Energy Impacts Symposium. Julia H. Haggerty, Kristin K. Smith.